Birds exhibit exceptional longevity and are thus regarded as a convenient model to study the intrinsic mechanisms of aging. The oxidative stress theory of aging suggests that individuals age because molecules, cells, tissues, organs, and, ultimately, animals accumulate oxidative damage over time. Accumulation of damage progressively reduces the level of antioxidant defences that are expected to decline with age. To test this theory, we measured the resistance of red blood cells to free radical attack in a captive population of greater flamingo (Phoenicopterus ruber roseus) of known age ranging from 0.3 to 45 years. We observed a convex relationship with young adults (12–20 years old) having greater resistance to oxidative stress than immature flamingos (5 months old) and old flamingos (30–45 years old). Our results suggest that the antioxidant detoxifying system must go through a maturation process before being completely functional. It then declines in older adults, supporting the oxidative theory of aging. 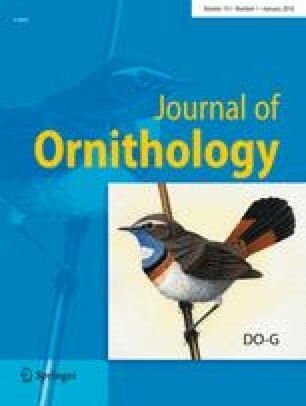 Oxidative stress could hence play a significant role in shaping the pattern of senescence in a very long-lived bird species. G. Devevey and N. Bruyndonckx contributed equally to the work. Communicated by C. G. Guglielmo. The experiments described herein comply with the current laws of Switzerland. This research was supported by grant 3100AO-104118 from the Swiss National Science Foundation.